In 2003 Mark started JST Capital Partners a long/short hedge fund with $15 million in assets. In 2009 Mark returned over $150 million in capital back to his investors with a cumulative return of 330% net of fees. Mark then began to trade as an independent trader and created Day Trade Well his first education company. Mark sold Day Trade Well to the Frommer Group where he was the head trader managing a team of 9 traders. When the Frommer Group closed in 2011 Mark formed Edge Trading as a means of higher instruction for new traders and veteran traders alike. Pivot Points are becoming more popular with traders working to find support and resistance levels based on the previous day’s price action. There are various ways to calculate pivot points, including averaging the open, high, low, and close of the previous day’s price. Here we talk with one trader about how he combines pivot points with specific moving averages to find trading opportunities each day in the markets. Tim Bourquin: Mark, What is your overall approach to the markets. Do you consider yourself a technician? A fundamental trader? How do you categorize yourself? Mark Moskowitz: I am an intraday trader, mostly equities, long and short sided, and I’m almost 100% technical in my nature of trading. I use just one strategy which is looking at basic pivot points. Pivot points are calculated in different ways, but they are basically places where price is likely to change direction. These pivot points are determined by the previous day’s open, high, low and close. Two of them are long points (places where a long trade might be appropriate) and two of them are short points (where a short trade may present itself). And when I get signals based on that, I will make trades on either the long or short side as the pivot points are approached. 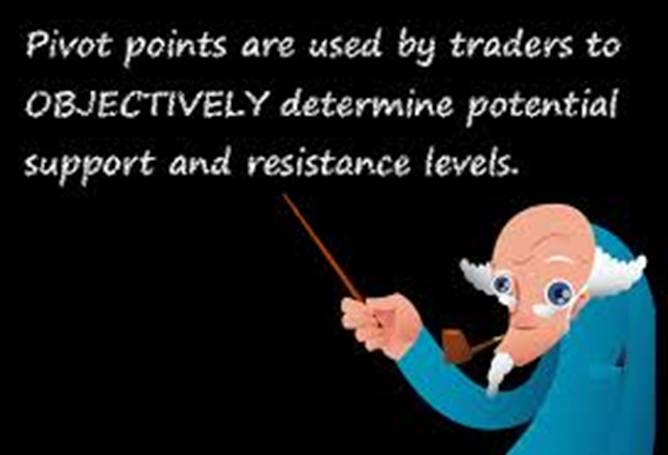 If the following day’s market price falls below the pivot point, it may be used as a new resistance level. Conversely, if the market price rises above the pivot point, it may act as the new support level. From there, I will use moving average lines – usually 20, 50 and 200-day moving averages – to look for confirming levels of support and resistance. Tim Bourquin: What types of chart timeframes do you monitor to see the moving averages and pivot points? Mark Moskowitz: The charts that I use are typically short-term in nature. I use a three-minute chart, a five-minute chart, a 15-minute chart, and then I look at a daily chart with those same moving averages. I’m simply looking for some level of support and resistance and hopefully getting some confirmation of the pivot point signals as well. I like to refer to the pivot points as my “generals on the field.” So, once I get a signal from the pivot point, it’s usually going to give me a chance to get into a position with some sort of size. If I get a pivot point where I’ll get the confirmation from a lower moving average moving up through a higher moving average at that same area, it’s an excellent trading opportunity. I typically find those on the three and five-minute charts. Also, if price reaches a pivot point and I see no overhead resistance from any of the moving averages, it will be “full steam ahead” pretty quickly. I’m also a very big believer in scaling-in to your positions, so that way when you’re wrong you have very few shares and when you’re right you have your max number of shares and I believe that’s what helps in getting consistent trading results. I put the ratios in my favor and that’s what has really been the key for me to become a profitable trader. So, if I get a pivot point signal but my moving average lines look a little tenuous at this point, I may go in with a 15% or 20% position, and then as soon as I get those moving averages moving back in the direction I need them to go, then I’ll typically scale up into a 75%, 80% or 100% of that position that I would like to get into. Tim Bourquin: And so what does 70%, 80% or 100% look like in terms of just pure share size? Mark Moskowitz: Well, it depends on the capital at risk, and I do all those calculations before the market opens in what I call my “pre-game strategy session.” I trade very high beta names because I like a lot of movement and price action. I’ve been trading a lot of the leveraged ETFs lately, such as SKF, FAZ, and SSO, as well as stocks such as Apple and Goldman-Sachs and Google, so I don’t need to trade a lot of shares to get a nice movement. On a stock like Apple, I’d say a full share size usually is 1500 to 2000 shares, so depending upon how much room there is between the pivot points I adjust my stop loss and profit targets accordingly. Tim Bourquin: Are you scanning the whole market for a pivot point opportunities or do you like to focus on these handful of stocks and the leveraged ETFs that you follow? Mark Moskowitz: For me, it’s primarily looking at a handful of names that I can study on a daily basis and get a feel for their movement during the day. I will look for some other names in the news especially during earnings season, but I am a big believer in getting to know your names very well and getting toknow them better than anybody else. I feel it gives me a little bit of an extra edge because sometimes I just know when something doesn’t look right. For example you might see an offer on the books out there that just doesn’t seem legitimate. After a while, you’ve seen it there a million times and if you go flipping back and forth to hundreds of different stocks each day you’re not going to really ever get that “feel.” So I have a core of 15 names that I look at and calculate my pivot points on every day. After I do that and if I still have some free time, I look to see what else is in the news and maybe see if there are other opportunities here and there. I also do pivot point calculations on the S&P 500 futures, so that I can get a feel for where the general market is going. Tim Bourquin: How many trades a day typically are you putting on and how many do you have on at one time? Mark Moskowitz: I will trade usually 60 to 80 times a day, so I’m a fairly high volume trader compared to many day traders. But that also includes scaling-in to positions. So, if I buy 300 shares of Apple and eventually get up to 1500 shares of Apple, that could be four trades. I also scale out of positions so that may be another four trades as well. I probably trade somewhere between 50,000 to 100,000 shares a day. I really don’t have much more than a couple positions on at a time. And as fast as my names move, I don’t like or need to have many on at a time. Also the stocks and ETFs I trade tend to be very highly correlated to each other, so if I’m getting the general markets moving in a direction, odds are I’m probably just increasing my stress levels and risk unnecessarily by adding on too many positions on at a time. Tim Bourquin: Your trading system seems relatively simple. How did you come about learning what worked for you personally? Mark Moskowitz: I think trading is all about understanding yourself, understanding your own mentality and learning what works well for you and then trying to find the system that fits that best. I mean, my attention span is probably shorter than the average person, so for me to be a day trader it just fits. I like to be in and know right away if I’m wrong. I also like to know if I’m right pretty quickly and I’m happy to take profits when they present themselves. Of course, I miss some larger moves, but that’s just my personality, that’s my style. I’ve talked to some guys and have sat next to other traders who watched 20 different indicators like MACD and stochastics and many others, and I think those are all good for everyone individually. For me, personally, I have my pivot points, I do them every morning, and once I do them I don’t need to think about them again for the rest of the day. They either get confirmed by my moving averages or they don’t – nothing is forced. I also do a lot of tape reading which is something that maybe can get a little more technical in terms of looking for support and resistance that’s not necessarily showing up on the chart. If I keep seeing a level that a stock keeps getting to and can’t quite get through it, and finally does get through it, I’ll feel pretty comfortable that the stock will continue to move higher. As you can tell, simple support and resistance are critical to me. Tim Bourquin: Let’s talk about that where you set stops. How do you find an area on the chart that you’re comfortable placing an order where if you’re wrong, you’ll be out quickly? Mark Moskowitz: Well, again, scaling-in with a lower number of shares helps a great deal for me to feel comfortable within a trade. So, if I enter a trade with a few hundred shares and it goes against me, what am I really losing? If I’m losing a dime or 20 cents that’s really not a whole lot of money – maybe $40, $50, $60. So that’s really the purpose for me of going in with a smaller amount of size. What I look for is a critical moving average line on the chart. For example, if a position is near its 200-day moving average, I may add in to that trade just because I’m sitting right on some heavy support. So, if it were to break that 200-day MA line, I know it’s time to get out very quickly. And then if it bounces off to 200 a day, I know I probably have a very good level where I can keep buying in. My stop-losses will usually be just below a major support moving average – maybe 15 or 20 cents – but a lot of it depends on what I’m trying to earn on the upside too. If the pivot point is telling me that I should be able to make a dollar or dollar fifty, I’m going to give it some room on the downside. I’ll give it 40 or 50 cents on the downside. As long as I’m keeping my profit to loss ratios at a high level, three, four, five to one, I’m usually pretty happy with that. Tim Bourquin: How do you set your profit targets? Mark Moskowitz: When I an calculating my pivot points, I’m always looking for a 2:1 risk-reward ratio. So let’s say that you do a pivot point on Apple and the buy pivot is a $120 and it gives you a stop-loss of 119.50, so you’re risking 50 cents. I’m looking for moving averages or some other support and resistance to show me my upside is at least to $121. So the best pivot points give you a 2:1 ratio. Now, it’s up to the trader and it’s up to the trader’s execution experience to figure out a way to get to that 2:1 up to a an even higher ratio. Tim Bourquin: And if you meet that profit target, are you out pretty quickly or would you take some of that off and, in just the same way you would on easing in, would you scale out as well? Mark Moskowitz: Scaling out of a position is where the art comes in to being a good trader. As you know, there is a science to it and there is an art to it. And the art of it, I believe, is scaling-in and out of trades. What I do is take 25% out on the first 50% of the move. So, if I’m looking to make a dollar in total on the trade, at the first 50 cents, I’ll take 25% of my position off. When it reaches what I consider to be my first target which would be the full level or full dollar in this case then I’ll take another 25% off. I would exit a full position with the remainder of shares once I got to a 3:1 level based on my stop loss. Tim Bourquin: Can you tell me what your “perfect” trade looks like? Mark Moskowitz: My perfect trade would be a pivot point giving me a signal and then pretty much at the same time, getting the moving averages to pair up with that. So usually what I like to see is a 20-period moving average coming up through the 50-day moving average at the same time, and I like to see those levels with a lot of support right underneath that level. If that happens right at a long pivot point, that’s a great trade. Tim Bourquin: How about the goals you set for yourself. Is it a flat monetary goal of making a certain dollar amount each day or week? Mark Moskowitz: No. I’m not really thinking in terms of dollars. I think in terms of percentages typically. So, while I think in terms of cents or dollars on my stop-losses, ultimately there can be more than 1% of my capital on any given trade. And I’m usually going to try to make anywhere from 2% to 3% of my capital everyday. So, just to keep the numbers round, if I have an account with a $100,000 in it, I’m going to lose no more than $1000 per day and I’m going to be trying to make somewhere between $2000 to $3000 everyday. To me, if you’re willing to lose 1% a day and you’re able to target upside of 2% to 3% a day, those ratios are great. You don’t need to be 80% right with those kinds of ratios, you just need to have good trades that you manage well and get out quickly when you’re wrong.